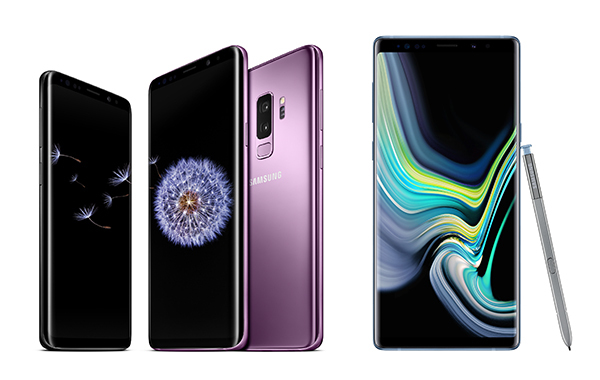 (From left) Samsung Electronics`s Galaxy S9, S9+, Galaxy Note 9. Users don’t have to install a separate app or sign up to use the rich communication service standardized by Groupe Speciale Mobile Association (GSMA), which allows an easy transfer of high-resolution photos less than 5MB and short video clips without consuming data. Users of RCS, considered the next test message service that is expected to replace cellular connection-based SMS (short message service), can also share large-sized photos, videos, music and documents up to 100MB in a chat room. SK Telecom will be conducting a promotional event allowing free transfer of 5MB to 100MB files until June. Like a mobile messenger app, it features a group chat and read receipt functions. SK Telecom will also add gift-giving and simple money transfer services to its RCS in the latter half of this year. The mobile carrier plans to make the service available through all Android-based smartphones beyond Samsung devices within the first half. It will apply it to Samsung’s predecessor model Galaxy Note 8, Galaxy 8 and S8 in February and also in upcoming Galaxy S10 series. The company will also become the nation’s first wireless carrier to launch a corporate RCS service within the first half. The corporate messaging service will be provided in a form of card message and include multimedia transfer feature.